Location: Guanacaste province - from San Jose, Inter-American Highway to Liberia. Highlights: well-marked hiking trails, thermal mud pools, waterfall swimming areas, freshwater lakes. Facilities: camping areas with restrooms, showers and picnic areas. Rincon de la Vieja means "the old lady in the corner". Located in the tropical dry forests of Guanacaste, this is one of Costa Rica's five active volcanoes. 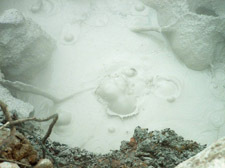 The mud pots are most active May to November. During the other months, cloud cover may make hiking and visibility a bit more challenging. The mud from these geological wonders is said to have cosmetology and medicinal benefits. Canopy tour, hot springs, horses, water slide, waterfall and mud bath. By horseback you can visit three waterfalls. 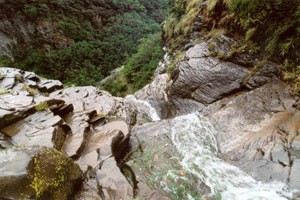 Each one has Natural swimming pools at the bottom of the falls. The thermal waters, steam bath, and natural spa are located at the foot of Rincon de la Vieja Volcano. At the hot springs, you will relax unconditionally as you enjoy pleasurable and rejuvenating treatments with volcanic mud and warm spring waters. This "spoil me" atmosphere makes it easy to forget the hustle and bustle of modern life. You simply cannot escape the ahhhhh. That sigh of satisfaction that marks a perfect end to the afternoon.